Paul Lassey, French harpist (from Lorraine - France), born April 25, 1965. From 18yo, he discovers diatonic and chromatic harmonica through respectively Charlie Mac Coy and Toots Thielemanss records, but realizes later - early 90s, with a Jean-Jacques Milteau masterclass this entire instruments potential. He then makes his debut in various bands from Lorraine, France: Kilimanjaro, Packard Blues and MG Blues Band. Professional musician since 1998, he turns his harmonica player career into teaching. In the early 2000s, thanks to the “Planète Clé de Sol” association, he uses harmonica as a therapeutic instrument for asthmatic children, through the Nancy Brabois hospitals “breathe workshops”. The harmonica-dedicated websites he administrates since years now have contributed to his popularity. In 2009, his website http://www.coursdharmonica.fr is even referenced in in the French edition of Winslow Yerxa and Jean-Jacques Milteaus book “harmonica for dummies”. As http://coursdharmonica.xooit.fr forums webmaster (counting more than 1900 members), he regularly organizes France-wide sessions, and gives lessons at his home, or to students all around the globe via Internet. His first album “Après lorage” is released in 2008 and guests Jean-Jacques Milteau who shares the “Nancy” composition with him Nancy, France, city where he comes from. He broadcasted a rough 260 pedagogic videos on http://www.youtube.com/ziharmo and edited 5 partitions and tablatures booklets, that can be downloaded on his website http://www.apprendrelharmonica.fr. 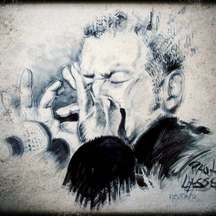 His last website http://www.lekrom.fr, dedicated to chromatic harmonica, has been recently released with the famous jazz harpist Olivier Ker Ourios sponsorship. Hes regularly on stage with Xavier Fischer and Pascal Lienard as part of “The Faros” trio, and with Serge Braidotti, the guitarist Michel Fedrizzi and more recently the composer-songwriter Christophe Freyssac as part of the “The Fat of Life” band.